There is no purer nor more perfect food than beautiful fresh berries. Cherries are my ultimate fruit, so sweet, so explosive in flavour. I am one of those people who will, if permitted, stand for up to 20 minutes picking through a pile of cherries to choose only the most flawless firm specimens. When it comes to raspberries, these delicate jewels are so fragile yet sharp in flavour that they are my immediate choice to pair with other ingredients like chocolate. My friend and fellow pastry professional Fionna gave me these berries and I decided to use them two ways. 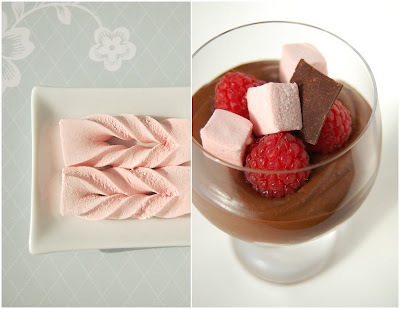 First, it would be tragic not to enjoy raspberries just as they are, so I paired them with some simple dark chocolate mousse which I had leftover in the freezer. Yes, you can freeze mousses and thaw them later for use but some loss of volume will occur inevitably. Second, I made a raspberry guimauve (a.k.a. marshmallow) by first making a purée and using a recipe adapted from a Derek Poirier recipe which I recently saw at a Valrhona demo. My previous guimauve experience has been using the Italian meringue guimauve method but I was pleasantly surprised at how well this cooked sugar/gelatin guimauve recipe worked. This summer long homage to fruit that you will witness if you continue to read my blog posts is inspired by all the local fruit farmers in British Columbia who you can meet at your local farmer's market. In fact, I am looking forward to visiting the Okanagan in a few weeks to pick my own cherries! More importantly, however, if you can not imagine life without fruit just like I can not, you need to become aware of a very serious issue concerning the plight of honeybees in North America. A recent episode of Nature on PBS called "Silence of the Bees" documents the potentially disasterous effect of a virus on honeybee colonies which could lead to an end to pollination of all flowering crops which include all the vegetables and fruits that we love. It seems inconceivable but unfortunately, this scenario is a distinct possibility without urgent intervention to help the honeybee population. Thank you to all the hardworking honeybees which make this fruit possible! Posted by Charmaine at 10:44 a.m.
Beautiful photos! No recipe for the marshmallow, huh?? That looks really interesting and something the kids would really love to try. I've also heard about the bee dilemma and am sick to think our lovely fruits and veggies will be inaccessible to us in the future. Let's hope some smart humans can figure out a solution. July 7, 2008 at 6:52 p.m. The pictures are beautiful. Raspberry Marshmallows sounds very intriguing. July 8, 2008 at 6:39 a.m.
You taunt me with those beautiful raspberry marshmallows and no recipe! July 8, 2008 at 8:04 a.m.
Wow...what a great dessert recipe! July 8, 2008 at 12:21 p.m.
lovely guimauve... i love that twisted effect! July 9, 2008 at 3:16 p.m.
some of my friends tease me, but when i see a bee, presumably thriving, i become really giddy. i am worried and tell everyone that will listen about the whole bee situation. July 10, 2008 at 10:49 p.m.
August 10, 2008 at 11:25 p.m.